Families can now explore the beautiful Sea of Cortez after the sun sets with the resort's new twilight LED paddleboard tour. Families in search of their next great adventure can now explore the wonders of the Sea of Cortez through Hooka diving and night LED paddle boarding experiences at Villa del Palmar at the Islands of Loreto. These are just two of the many spectacular sea adventures guests can expect to experience while vacationing at the resort. Known as the “Aquarium of the World,” the Sea of Cortez is home to nearly 1,000 species of fish and marine life, making Villa del Palmar at the Islands of Loreto a destination for those seeking unique and spectacular sea exploration. Guests can now go beyond snorkeling and discover the resort’s newest diving activity, the Hooka diving reef tour. During the tour, four guests at a time are attached to a “Hooka” floating air device that allows them to swim at a depth of 20 feet while being surrounded by colorful fish and sea creatures. For only $51 per person, guests can embark on a two-hour boat tour with bottled water, snorkeling, expert instruction and 35 minutes of Hooka diving. This safe and friendly diving experience is available for guests ages 12 and up and is available every Tuesday and Thursday from 9:30 to 11:30 a.m. 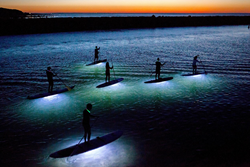 Families seeking a water adventure after the sun sets can try out the resort’s new twilight LED paddleboard tour, an experience that allows guests to explore the reef south of Ensenada Blanca at night while cruising aboard an illuminated paddleboard. The LED lights on each board brighten the seabed and attract wildlife that can only be seen during the late afternoon and evening, making this excursion a true rarity. With LED paddle boarding packages priced at $40 per adult and $20 per child, ages 10 to 12, parents and kids can enjoy breathtaking night views while bonding over the once-in-a-lifetime opportunity. Twilight paddleboard tours are offered Mondays, Wednesdays and Fridays from 7:30 to 9:30 p.m.
To reserve a spot on a twilight LED paddleboard tour or Hooka diving excursion, please contact (613) 134-1037 ext. 4301 or 4911 or visit http://www.viajesdanzante.com. The Islands of Loreto is known for its quiet beaches, scenic vistas, rich history and astounding natural habitats. The region caters to adventurous travelers looking to spend some of their vacation trying activities such as scuba diving, hiking, fishing and mountain biking. There’s no better place to learn how to scuba dive than in the lush underwater playground of a United Nation’s World Heritage Site. With more than 100 miles of coastline, 300 sunny days a year and year-round surface temperatures averaging in the 80s, the 800-square-mile Loreto National Marine Park boasts dozens of small rocky islands, plunging walls, underwater pillars and finger reefs – a diver’s paradise. Other opportunities to explore the Islands of Loreto include biking and hiking tours, offering panoramic views of the majestic Sierra de la Giganta mountain range and pristine Danzante Bay. Guests can also get centered with yoga on the beach, mountainside or even in the comfort of a private terrace. Additionally, the resort will be unveiling its new 7,400-yard Rees Jones-designed golf course this fall. The course will overlook the breathtaking Danzante Bay and the Sea of Cortez, offering travelers another avenue through which to explore the region. For resort reservations or additional information, please contact the resort at reservaciones(dot)vdpl(at)vgloreto(dot)com or call 800.790.4187. To learn more about Villa del Palmar, contact your preferred travel professional, visit http://www.villadelpalmarloreto.com or call the number above. Villa del Palmar at The Islands of Loreto is a luxury destination resort on the Sea of Cortez, off the eastern coast of the Baja peninsula overlooking Danzante Island (one of five in the region). Flanked by the rugged Sierra de la Giganta range, the Villa del Palmar is the first and only resort to occupy one of the Gulf of California's last virgin coastlines. The resort features 181 new, spacious, beautifully appointed Deluxe Ocean View, one, two and three bedroom Suites with terraces and stunning ocean and mountain views, three restaurants offering gourmet dining, an attentive English-speaking staff, five swimming pools, a 39,000 square-foot Sabila Spa and Wellness Center, two tennis courts, beautiful beaches, a private beachfront Danzante Bungalow and a mild and warm climate year-round. The 7,400-yard Rees Jones-designed Danzante Bay golf course will offer a challenging, yet friendly course that works with the natural beauty and serenity of the surrounding environment. The resort is also currently named the 16th best resort in Mexico by Trip Advisor. In 2015, Travel Weekly magazine recognized the Islands of Loreto with a 2015 Silver Magellan Award in the Adventure Destination category. Villa del Palmar at the Islands of Loreto was also recognized as Mexico’s Leading Beach Resort in the 22nd annual World Travel Awards. For additional information on events, amenities, or availability, call 800.790.4187 or visit http://www.villadelpalmarloreto.com. Stay up-to-date on the latest happenings by finding us on Facebook (http://www.facebook.com/villadelpalmarattheislandsofloreto) or Instagram, Pinterest and Twitter as @VilladelPalmarL.